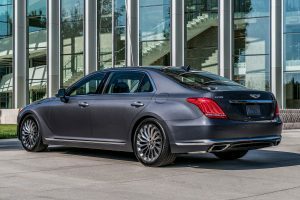 What do you get when you take one-part Mercedes-Benz S Class, one-part Lexus LS, sprinkle a dash of BMW 7 Series and a hint of Audi A8? 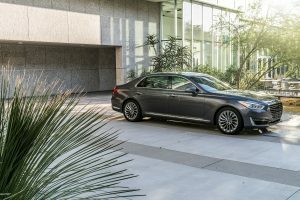 The result is the all-new Genesis G90 Super Sedan! 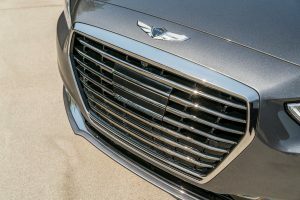 Car brands, like good wine, need time to mature, and that is exactly what is happening with the luxury brand from Hyundai known as Genesis. There have been some previous generations, even a short-lived, higher-end version of the Genesis called the Equus, all great stepping stones to the Genesis brand we know today. As a lucky journalist, I get to drive a lot of different cars, including all the high-end cars that Genesis used to benchmark and create, pun intended, this latest version of a super sedan. It has that elegant, je ne sais quoi subtle look and feel of luxury that is incredibly difficult to get right and Genesis has nailed it in the G90. The interior is inviting, luxurious and fully appointed with everything that a buyer for this caliber of car is looking for. The driving dynamics are world-class, offering a refined, quiet and elegant experience. So, what’s it like? Let’s get started with our impressions. 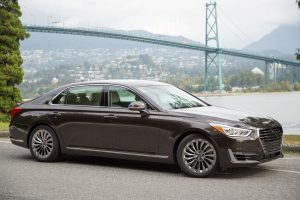 Approaching the Genesis G90 from any angle, you instantly recognize it to be an elegant shape even if you don’t know what a Genesis is or who makes it. The grill is stately, yet not over the top, the wheels are finished in a distinct silver polish that make them both elegant and sporty at the same time, while the back of the car offers an understated, integrated exhaust tips, that once again, convey an air of luxury and quality. First impressions upon entering the cabin are of sereneness and comfortable elegance. Fit and finish are first rate and the design architecture is once again, inspired by the best of Japan and Germany. Seats are finished in butter-like leather featuring ventilation and fully electric. 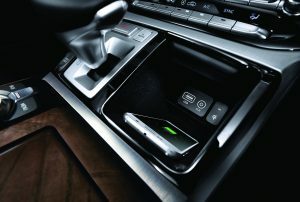 The sumptuously appointed and heated steering wheel offers all the major functions for audio, cruise, menus and set ups. The center dash offers a surprisingly large and well-integrated infotainment system, featuring all the pertinent information that is easy to read and understand. In the center console, there is an articulating multi-function rotary knob that is easy and intuitive to use. The headliner and side pillars are covered with an elegant suede material that complements the luxury appointments nicely. Now for the best part of the G90; the rear seats. Think Business Class seats on a wide-body aircraft and you start to get the idea of what these rear seats are like. 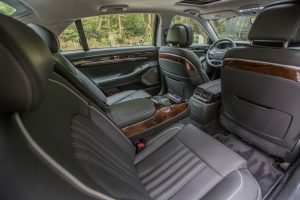 There are individually controlled and reclining left and right seats, with a large center arm rest featuring audio, ventilation and rear shade controls. Front back rests offer two individual monitors that are perfect for any long trip. I could not resist and I decided to sit and watch some music videos in the back seat one evening, Wow! Leg room is S-Class level and the surroundings and all touch points are supremely comfortable. During our all too short of a week with the Genesis G90, it was used for all kinds of daily tasks, performing flawlessly in each of them. From a 40+ mile commute to and from work, to a supermarket run, to dinner with friends, the G90 was perfect in each. From the driver’s seat, there is total quiet in the cabin, even at 70 miles per hour. The high-end audio system pumped the sound of Frank Sinatra or Katy Perry perfectly. Our G90 tester came with the optional 5.0 liter, V8 engine which handled the size and weight of the G90 without any strain. In fact, I was next to my sister in a stop light and she was in her BMW 7 Series. I gave her an evil grin and blasted off the light, leaving her in the dust. Later, she remarked how surprisingly fast the G90 was. I simply looked at her with a smug look. Yes, the word surprise came up a lot during my tenure with the G90. Having driven the previous generations of the Genesis, I did notice one nice evolutionary improvement, the suspension. It feels much more dynamic as compared to a hollow-like feeling from the earlier cars when going over a speed bump or a road imperfection. Bravo Genesis! Brakes are easy to modulate and direct, thus able to do limo stops with ease. 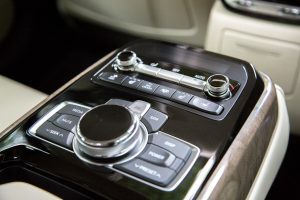 Throttle pedal easily conveys small inputs with precision, making stop-and-go traffic feel smoother, a key factor in feeling comfortable and less stressful during traffic. Overall handling feels like a mix of the cars I mentioned above. Soft, luxurious, compliant ride with a hint of European sportiness thrown in. An AWD version as well as a 3.3-liter turbo, six cylinder, AWD and RWD models are also offered. 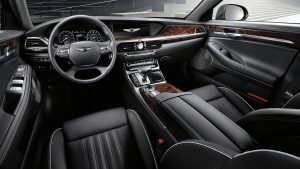 The Genesis G90, it’s like a perfectly aged bottle of wine whose time has come to enjoy and savor. ← What a Proper Sports Sedan Should Be!